Borsellino Salami for sale. Buy online at Zingerman's Mail Order. Gourmet Gifts. Food Gifts. 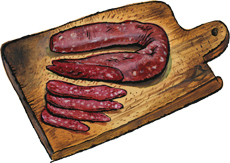 La Quercia's borsellino salami is soft, sweet, porky and even a little earthy. It's dry cured salami. It needs no cooking. Just slice and snack. Somewhere between a quarter and a half-dollar in diameter, its natural casing is stuffed with pork that's coarsely ground, liberally littered with morsels of fat. Slice and serve on a cheese plate or toss chunks into pasta or salads. Throw one into your backpack the next time you head out for a hike. It can go for hours—or days—without refrigeration. The piccante salami reminds me a bit of Spanish chorizo—smoky and slightly spicy, but not at all hot. Like all their meats, La Quercia's salami are made from hogs raised naturally, without hormones or sub-therapeutic antibiotics. They're cured and will last weeks in your refrigerator.